The CrossFit Games pits a selection of the fittest athletes on the planet against one another as the elite of the sport descend upon Carson’s StubHub Center in pursuit of the 2016 title. 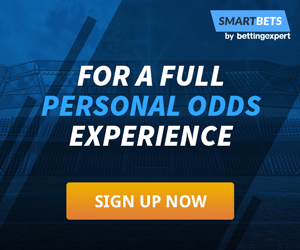 Athletes will compete in the men’s and women’s fields, as well as in the team category, and What Are The Odds has the lowdown on all the favourites leading up to Friday’s big kick-off, per Paddy Power. 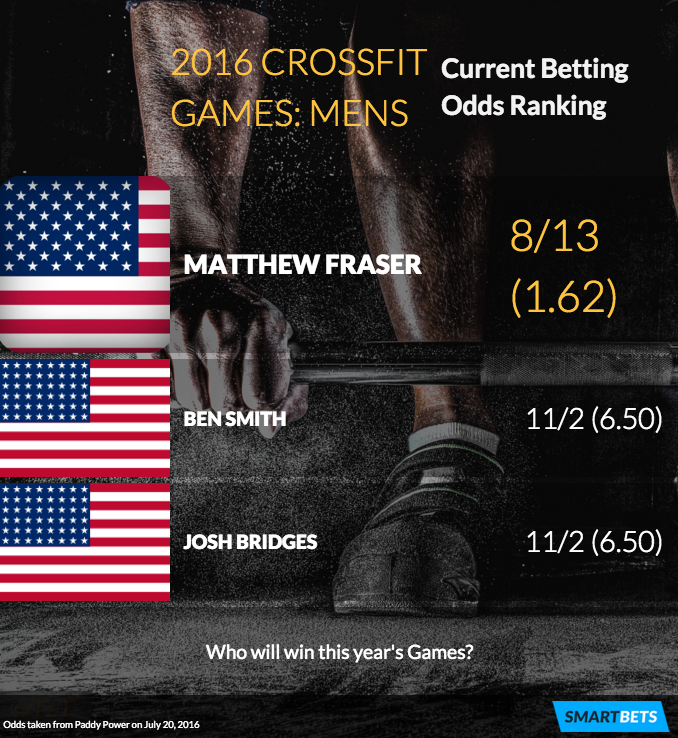 After two years of having to settle for runner-up at the CrossFit Games, Matthew Fraser is a favourite at 8/13 (1.62) to go the whole way and take top spot in the men’s competition this year. The 26-year-old finished second to Rich Froning in both the 2014 and 2015 CrossFit Games, but he’s well-placed to make another run at the gold this time after finishing first at the East regionals for a second year in succession. Speaking of Froning, the four-time men’s champion won’t participate in this year’s event, which means reigning champion Ben Smith is the only previous winner lining up, and he’s at 11/2 (6.50) to clinch back-to-back first-place finishes. He’s level in the odds alongside Josh Bridges, who finished fourth in the 2014 CrossFit Games—a shade better than his seventh-place finished in 2013—and he’s hoping to make another big push this year. CrossFit hasn’t crowned a back-to-back women’s champion since Annie Thorisdottir became the first athlete to seal successive first-place finishes in 2011 and 2012. That being said, Icelandic compatriot and fellow Reykjavik native Katrin Tanja Davidsdottir is priced at 13/2 (7.50) to match her feat this year and follow up her 2015 gold medal with one more in California this weekend. However, Australian Kara Webb is the favourite to take home the top prize in Carson, currently listed at 7/4 (2.75), although she’ll need to firmly outdo the personal-best fifth-place finish she mustered last year in order to do so. 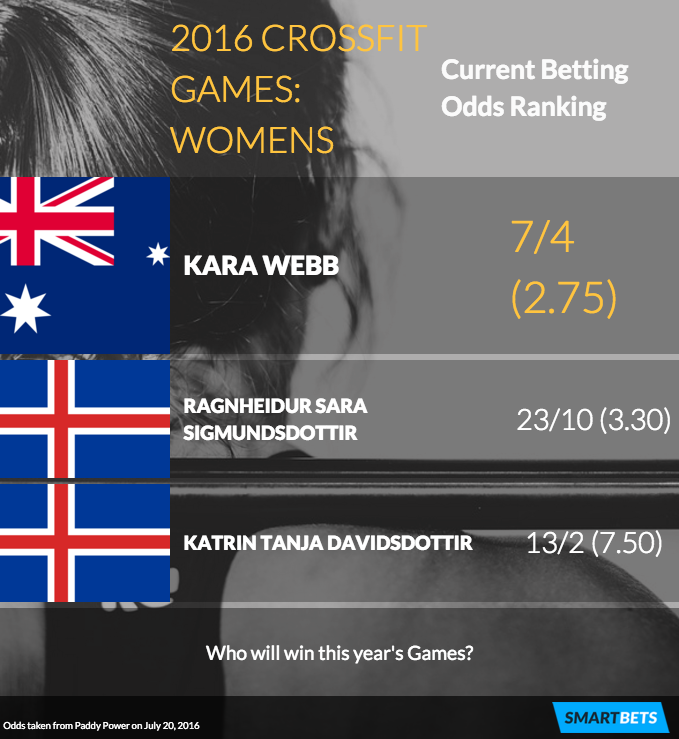 Thorisdottir herself is back in the mix for 2016 and is level with Davidsdottir at 13/2 (7.50) in the odds, while Ragnheidur Sara Sigmundsdottir is a close second-favourite to Webb at 23/10 (3.30) and makes it three Icelandic females among the top four favourites. Punters may also want to keep an eye on 2014 champion Camille Leblanc-Bazinet as a 14/1 (15.00) dark horse, considering she knows what it takes to go all the way, while this could be a breakout year for Invictus starlet Lauren Fisher, 22, who is listed at 11/1 (12.00). The team event looks to be the least competitive of any this year, with Froning’s Team Mayhem Freedom a steady favourite at 10/11 (1.91) to retain their 2015 title. CrossFit Parallax, Team Dynamix and CrossFit Milford Black are next in the odds from there at 7/1 (8.00), while 2014 winners Team Invictus are a firm outlier at 11/1 (12.00).